Insulating your home is your best means of saving money month after month on your utility bills. 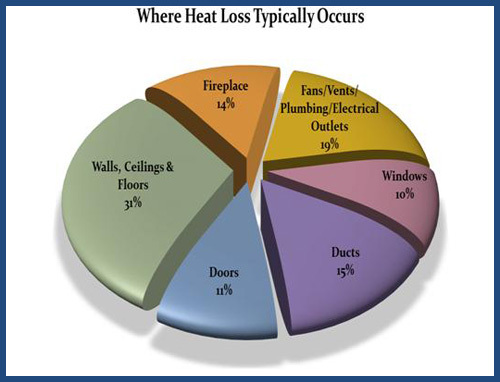 According to the Department of Energy, 30-45% of all energy wasted is lost through the roof and walls of a home. The fact is, when cellulose insulation is properly installed by a professional insulation contractor, no other energy improvement investment is recouped faster. Click here to calculate your energy savings! Fiber-lite cellulose insulation is installed in attics and easily applied over existing insulation. It is an ideal product for cathedral ceilings and may be installed into sidewalls of existing home. Fiber-lite is treated with a 100% sodium polyborate flame retardant and is non-corrosive to metal. Fiber-lite offers maximum thermal performance and will save you money on monthly utility costs. InCide® pest control insulation can be installed in attics, interior and exterior walls, and can prevent or forestall insect infestations in the areas where it is applied. InCide® pest control insulation provides continuous, nonstop pest control protection and lowers heating and cooling costs. This EPA registered product can only be installed by a licensed pest control operator. If insects are an ongoing concern in your home, you can enjoy the benefit of added protection with InCide® insulation installed in your attic. InCide® insulation contains 14.72% boric acid which was first registered in the US in 1948 as an insecticide for the control of cockroaches, termites, fire ants, fleas, silverfish and many other insects. It acts as a stomach poison affecting the insect's metabolism and the dry powder is abrasive to the insect's exoskeletons. The insects can be affected either by ingestion that occurs during grooming or by simply crawling over the product. Because boric acid does not break down, it will provide long term control of insects. Click here to watch a video on the fire studies of different types of insulation.